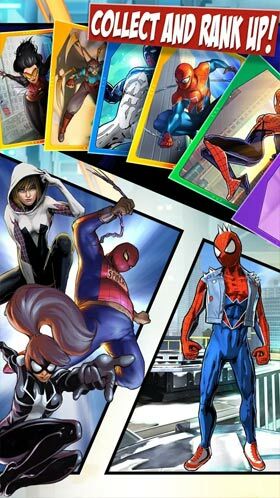 MARVEL Spider-Man Unlimited Full Apk + MOD + Data is An Arcade Game for android. Swing into a hand-drawn, action-packed arcade adventure game that feels like it came straight from the Marvel comics! Unite every hero in the Spider-Verse against the ultimate threat! Recruit an army of Spider-Men to combat the new Sinister Six, who have opened a dimensional portal in New York to summon endless versions of themselves! The Sinister Six are moving from dimension to dimension, destroying each one. Now ours is fighting to survive! 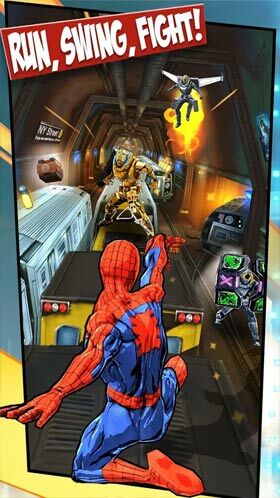 • Enjoy the thrill of the first Amazing Spider-Man arcade web-runner! Swing, run and fight through chaotic NYC in over 5 different environments! • Go beyond an endless runner game with superior fighting and running gameplay! Combat dimensional super villains, web-swing, go running up walls and perform skydives! • Play story mode with 5 boss battles to fight and 25 missions per Issue! The action never stops with new daily and weekly events and spectacular rewards in Events Mode! Or run to the top of the leaderboards in Unlimited Mode! • A continually running, episodic adventure game: The Sinister Six are moving from dimension to dimension, destroying everything in their path – and our world is next! But this ultimate army of Spider-Men is fighting to give the Six a run for their money! • Dive into the endless fun of the amazing Marvel Universe, spanning over 50 years of Spider-Man with iconic characters, including multiple variations of each hero (as well as Nick Fury, Mary Jane, and Black Cat) and villain! THE MOST SPIDER-MEN IN ONE GAME! • Summon, collect and play with an endless supply of Spider-Man cards from across Marvel’s amazing comics, including Spider-Man Noir, Iron Spider, Cosmic Spider-Man, Scarlet Spider, and the Bombastic Bag-Man! • CONSISTENT RELEASE OF NEW SPIDER-MEN! Bro update mod to latest version. I know u can do it please I have many hopes from u. And u r the best website. any update bro about the offline gameplay and the mod? I thought it was anti ban I try to buy my first character and it say I am temporarily banned I just started. Also sorry for my email I know it’s offensive but it was made for me when I was young. isn’t there a way to play this game offline? This is online game.. you must mention admin..